Ohio State University has appointed offensive coordinator Ryan Day to serve as acting coach during an investigation that has sidelined head football coach Urban Meyer, according to The Columbus Dispatch. The school placed Meyer on paid administrative leave Wednesday amid allegations that he was silent about alleged spousal abuse involving former assistant coach Zach Smith. Smith’s wife, Courtney, said she told Meyer’s wife, Shelley, in 2015 that Smith had abused her and that she believed Meyer knew about it at the time. Courtney Smith’s allegation contradicts Meyer, who denied knowledge of the abuse accusations at the time. Meyer, 54, got his professional start in college football 32 years ago as a graduate assistant coach at Ohio State, the Dispatch reported. Earle Bruce – Smith’s grandfather – gave him that start. Fall camp for the Buckeyes begins Friday. 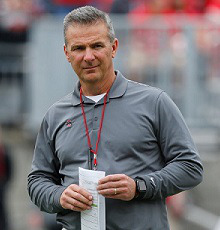 Meyer has an impressive career coaching record, with a 73-8 record at Ohio State, where the Buckeyes also won the inaugural 2014 College Football Playoff championship. Overall as a head coach, his winning percentage of .851 ranks him third among Division 1 coaches who have coached for at least a decade – just behind Knute Rockne and Frank Leahy. A contract extension increased Meyer’s 2018 salary to $7.6 million, a raise of $800,000 over what he was scheduled to earn.